Withered and dried over pine fires, this distinct & famous black tea of China was first produced in the 17th century during the Qing dynasty. 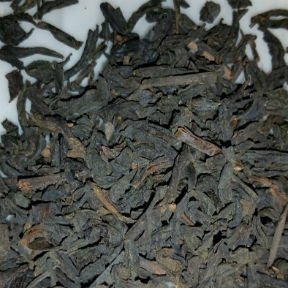 It is considered the oldest black tea produced. Very few have a neutral response to this tea. Open the pouch and the delicious deep smoke will remind of you of campfires and, maybe, London tea rooms, where this tea has been popular for over 300 years. This tea can be enjoy on its own or with milk and sugar. This is a high quality tea that has naturally absorbed the smoked flavor from the pine fires used for withering and final drying. This makes it a wonderful tea for culinary use to add smoked flavor to soups, barbecue marinades, meat and fish rubs for grilling, and to cocktails. Cheaper Lapasang Souchong are artificially flavored with unpleasant aftertaste.